In this game of recreational espionage, one team orchestrates a wild goose chase designed to whisk a Defector away from the watchful eyes of their rivals. The surveillance team tries to track the Defector and photograph them making contact with the enemy. Then, the teams switch roles and do it all again. Both rounds of this fast-paced game should conclude in under two hours, then dinner. Everything from team formation to planning will happen on-site, no prep required. Tribes of prehistoric vegetarians will hunt dinosaur puppets with wiffleball spears, while trying to avoid the predations of ptreacherous pterodactyls. With each meatless kill, they'll claim a new dish for their vegetarian picnic. Volunteer Puppeteers Needed! Must be able to run fast whilst impersonating a paleontological creature. If you're interested, post a comment below or find us on Facebook. A donation of $5, to cover food, would be appreciated. Volunteers eat for free. The world of which one symptom is the moon is the same world of which one symptom is the poet. When: Saturday, May 14th 12:00 p.m. Starting Location: To be announced on Friday the 13th. To Register: Email mnzeropq@gmail.com with your Team Name and the names of your players. Four players are recommended, three is also acceptable. Registration for MN0PQ:9 will be capped at 15 teams. Should this cap be reached, teams will be permitted to include a 5th player. If you are registering with fewer than 4, please indicate whether you are open to taking an extra player (highly recommended). *Persons with disabilities are more than welcome to use assistive technologies in place of feet. MN0PQ:9 will begin at the amphitheater at the south end of Nicollet Island, just south of the Nicollet Island Inn. (If you are driving, do not park at the Inn). Team check-in starts at 11:15 a.m. -- check in early, as the game will start promptly at Noon. It should run approximately 5 hours. All team members should bring a clipboard, scratch paper, pens and pencils, scissors and tape, and an umbrella. We are expecting scattered showers tomorrow, and not all puzzle locations will have shelter. Team registration is now closed, but there may still be room. If you have not registered but would like to play, come to the island we'll try to fit you in. Where: Calhoun Square, first floor. Two teams compete to rescue a would-be Defector from the clutches of a fascist police-state! While one team conducts surveillance, the other orchestrates a wild goose chase designed to make the Defector disappear. Then, the switch sides and hunters become the hunted. 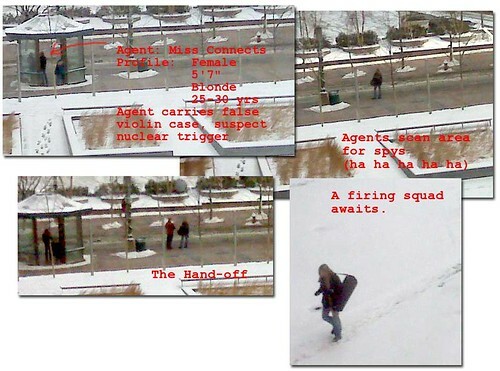 Teams of amateur spies compete to pull off the best covert op, right under the opposition's nose. If you wanna get recruited, become a Fan on Facebook and make your calamitous intent known. If you just want more details about the game, try DanielBayn.com/tradecraft.